In 1996, Dennis Specialist Vehicles announced its intention to cease production of the Dominator and develop a new model called Arrow. The chassis of Arrow was derived from single-deck Lance. Dennis designed a 3-axle derivative from Arrow for Hong Kong, and gave a different name, Trident. However, Trident is not simply a 3-axle Arrow. Trident is quite different from the Arrow model, especially for the lower-deck floor. There is still one step for both the entrance and exit for Arrow, but Trident is a low-floor double-decker with no step in front of the second axle. The Trident (VIN: SFD111AR1TGT10102) with the new ALX500 body arrived in Hong Kong for the first time on 28 May 1997. 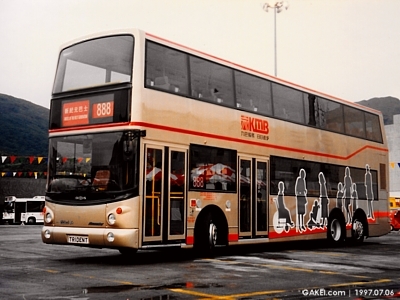 The body was originally painted in standard colour of Kowloon Motor Bus ("KMB"), however it was later repainted in gold with some special graphics, to demonstrate that this bus was suitable for everybody including those disabled. 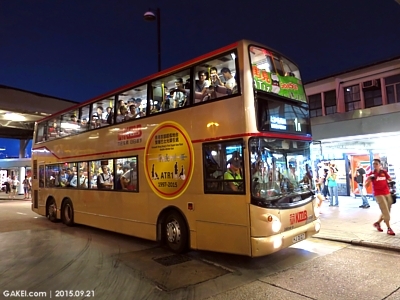 Before starting passenger service, the bus was officially demonstrated to the public for the first time in the event of "Public Transport Cares for You" organized by Government's Home Affairs Department and various public transport operators on 6 July 1997. The bus was then registered as HJ 2127 on 22 September 1997, and KMB allocated ATR1 as the fleet number. After a series of route trials, ATR1 started passenger service on Route 1A on 17 November 1997. After 18 years of operations, the bus retired from passenger service on 21 September 2015. You can view the photographs of various Dennis Tridents by following the hyperlinks at the top and at the bottom of the page. Photographs of ATR1 are available on the page of "ATR1 (2)". ATR1 in 1997 (Left) and 2015 (Right).